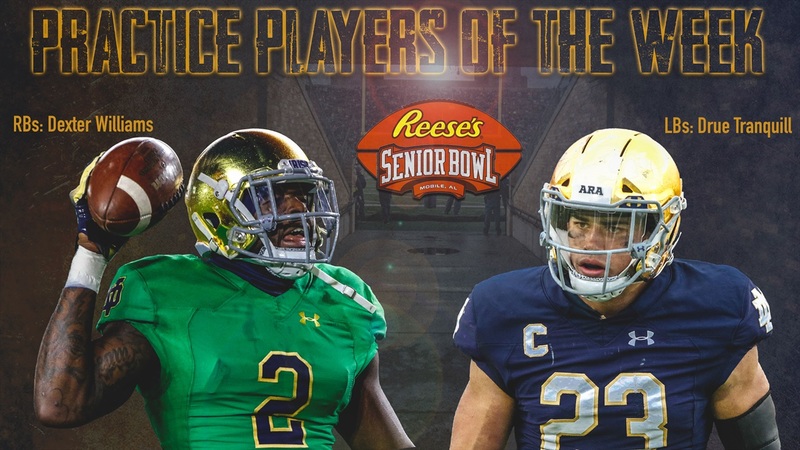 The Reese's Senior Bowl is crucial for guys to make final impressions on NFL scouts and that means the week of practice is huge for guys like Dexter Williams and Drue Tranquill. Both players have interesting backgrounds where a good week in Mobile, Ala. could raise their draft stock significantly. It's clear Williams was the best back at the Senior Bowl this week during practice as NFL Twitter gushed about the South Florida native. Williams also impressed his coaches and those who truly matter as he took home the award for Practice Player of the Week for the running back position. Tranquill, who will still need to show teams he can stay healthy, was able to prove he can play inside backer and while he didn't have the hype on Social Media (they can't tackle during practice), the Fort Wayne, Ind. native took home Practice Player of the Week for the linebackers. You can watch Te'von Coney, Tranquill and Williams play in their final collegiate game on Saturday at 2:30 PM ET on the NFL Network.